Admire the treasures of Acapulco and the Downtown Area on this fascinating 4-hour walking tour. With a knowledgeable guide, see the divers, enjoy stunning views of Acapulco from the San Diego Fort, and explore the Museum beneath its walls. Walk the Downtown area, and venture inside to see its Cathedral and Main Square. Stroll through the Zocalo, view the old constructions of this fascinating city. If in any moment you decide to stop the walking tour to continue by car it is always possible. 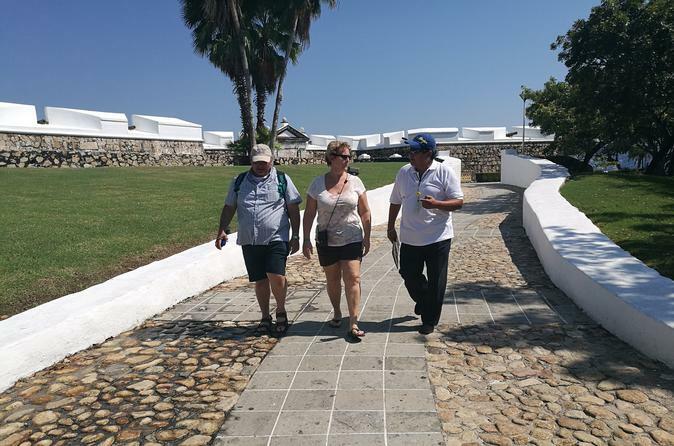 Your friendly and knowledgeable tour guide will look for you either at your Hotel or Cruise Ship and set off with your on your 4-hour walking tour. Climb the hillside as your guide describes the La Quebrada´s High Cliff Diving Exhibition. If you come to Acapulco you have to see the Diver. If you do not see the Dive you did not come to Acapulco. Finally enjoy beers, margaritas, sodas or piña coladas in a Silver Show nearby. After this we will head back the Cruise Pier or your Hotel where we started the tour. If necessary and whenever you feel like we can always take a vehicle and avoid walking, you are the boss. Special Offer - Book and travel by September 24 and save 10% off our previously offered price! - Book Now!